Glastonbury lowered its season's best by another .05 and took the win by staying a little ahead of a Windsor team that finished in 1:45.74. RHAM finished a little in front of Danbury for 3rd, and Bloomfield edged Weston for 5th. Glastonbury got to within a second of the meet record with a 3:58.85 that was almost four seconds ahead of a 2nd place Bloomfield squad that included Terry Miller and Jillian Mars. Windsor qualified for finals from the least-fast first heat of preliminaries, and it knocked more than ten seconds off its seed time in the finals to finish 3rd in 4:04.14. Taking the final three scoring places were Hillhouse, Plainfield, and Weston. In the closest race of the day, Class S winner Immaculate edged LL winner Ridgefield by a hundredth of a second with a lean at the tape for a time of 9:34.04. 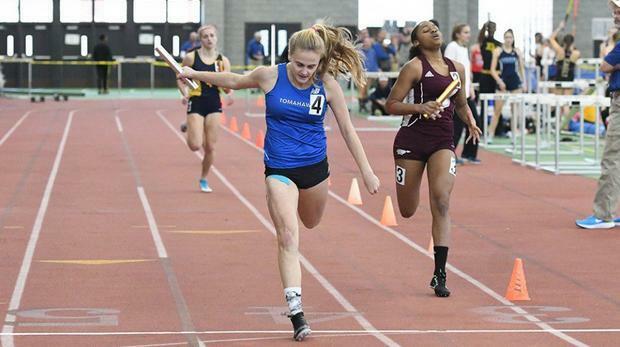 Trumbull and East Lyme were 3rd and 4th, Danbury took 5th from out of the first section, and 2018 winner Glastonbury picked up one more relay point with a 6th. Perhaps the big surprise of CIAC meet was sprung in the SMR's second section as Class L winner East Lyme and M 4th place finisher Berlin came in far ahead of the teams in the third section with the fastest seeds. Hillhouse, Cromwell, Old Saybrook, and Hall all finished more than two seconds behind the top two teams with times all above 4:20.00.